Read indoor/outdoor temperatures from inside. Bold red and blue numerals. Extend tubing out window to read outdoor temperatures from indoors. Temperature range -45°F to 115°F and -40°C to 55°C. 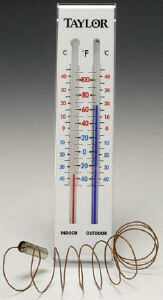 Read indoor and outdoor temperatures from the inside. Bold numerals in bright red and blue.